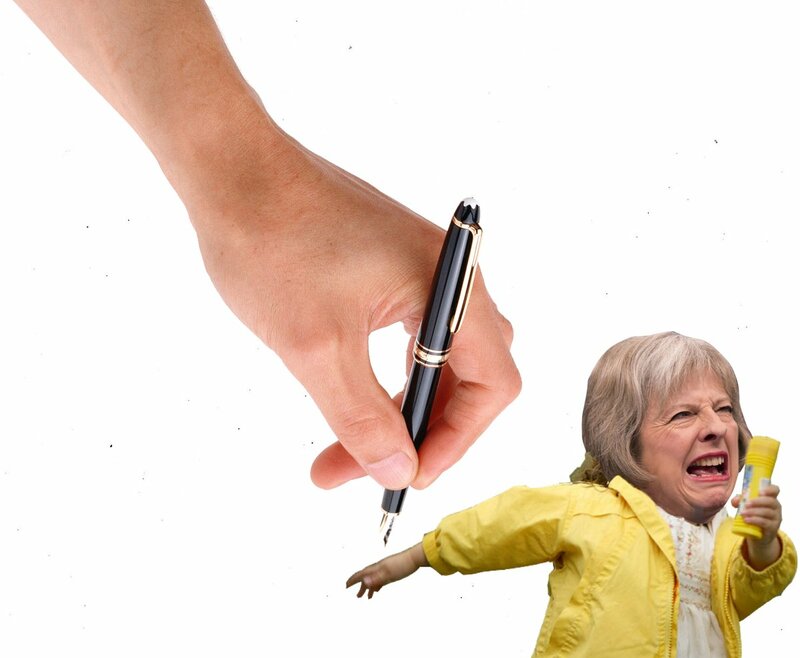 The recurring theme of the #GE2017 is of an elite scared of any dissent, whether its the Thurrock Lies footage, the censorship of Mr Ethical at the Rye hustings, the fear in the PM’s face as she stammers out ‘Are you a journalist …. ?’ at a factory visit, the repression of the Captain Ska’s anti-Tory song Liar Liar (which they then added insult to injury by asking him not to “go too hard on the Tories”), the multiple media refusals by Theresa May, or the Scottish press’s inability to report on an Edinburgh film-maker who produced a film predicting the Corbyn phenomenon weeks before it happened (and subsequently was locked out of all of his social media platforms – despite achieving a million views) – only The Canary covered it. When Bella put it to two well known Scottish journalists they treated us with complete contempt and refused even to watch it. The overwhelming theme we’ve seen day after day is fear. Fear of the public, fear of ordinary people, fear of the most plaintive easy questioning, fear of having to defend their track record in office, fear of the world outside their gothic pallisade. As the PM comes to Leith (allegedly) the Tories love of carefully choreographed “public” events looks more and more bizarre. This country has changed utterly in the past twenty years. Does anyone remember the ‘man in the white suit”? We are a long way from Martin Bell. These are both politicians in a state of fear, both unable to engage in public discussion, both hiding behind threats or censorship, both colluded with by timid chairs in supposed democratic public events. Both of these simple examples are an absolute affront to democracy. Many on the left point out the inadequacy of parliamentary politics, how its stage-managed, framed and filtered from beginning to end. But if this election proves anything it is that social media makes there less space for candidates to hide. Mr Ethical is today’s man in a white suit, but instead of being celebrated he’s smeared and ridiculed. This is Project Fear eating itself, live. 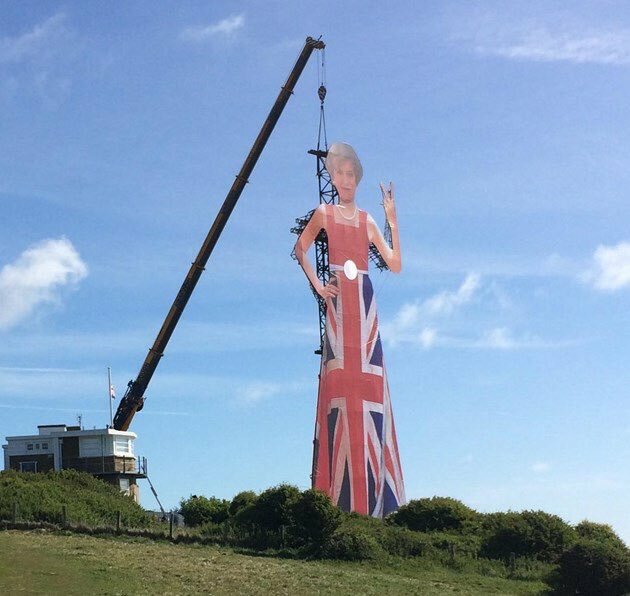 As someone in Kent erects a huge version of Theresa May – equal parts Little Britain – Boadicea – and The Wicker Man – giving the whole of Europe the V sign from the White Cliffs of Dover, this General Election has an air of un-reality about it. Maybe it’s the hot-weather the screeching tone or the uncomfortable shifting as Theresa May and her Home Secretary squirm under the mildest scrutiny, the colour draining out of their faces. Maybe it’s the madness of Katie Hopkins on US television with ‘Person of Interest’ Nigel Farage talking about how we “should round up the Muslims”. There’s fear too in the Telegraph declaring Colonel Ruth the Queen of Scots and working themselves up to declaring a landslide defeat as a magnificent victory. I predict a Tory majority of about 50 seats, sadly. Don’t underestimate their massive support in England, aided by the collapse of UKIP. In addition, Corbyn isn’t very popular in traditional Labour seats in the north of England. Neither you, me, nor anybody else is in a position to predict anything, my friend. The organ grinder in chief according to some. I wouldn’t let her anywhere near my organ,let alone grinding it! I’ve talked to some people who regard displays of distancing and dissent-crushing authoritarianism as strength, which is odd, since it seems a clear sign of weakness and indeed fear. Simply ‘winning’ an election where you have inherited and augmented a stacking in your favour will hardly quell such fear, as the sand it is built upon could be washed away in the next storm. And predicting the political weather is as prone to chaos as the meteorological kind.